The huge Samoan Joe Tekori has most recently been seen by most Irish and British rugby fans tearing up Twickenham and Cardiff for the Barbarians in their end of season friendly against England http://www.dailymotion.com/video/xj0onb_big-joe-tekori_sport and ridiculous ‘test match’ against Wales [yes, the Welsh awarded caps; they came with a little mullet at the back]. French readers of the blog may have had the pleasure of seeing him have an absolute monster of a season for Castres Olympique, although I’d imagine Pierre Rabadan doesn’t have too many pleasant memories of him: http://www.youtube.com/watch?v=0YSa-gh2gWI. Or any memories at all, actually. He was mostly used in the second row by them in the Top 14, racking up 1643 minutes and a whopping 9 tries, which made him Castres’ second highest try-scorer and the Top 14’s joint fifth highest; he wasn’t just the try-scoringest forward in the league, he was the try-scoringest non-back -three player. That’s a hell of an accomplishment for a guy who spends an awful lot of time in the No5 jersey. He earned a spot in Midi-Olympique’s Top 14 Foreign Dream Team of the Season [a team selected from the best non-French qualified players playing in the league] in the second row and he certainly has the size for it: 198cm [6’6”] and 122kg [19st3lb]. However, he has played in the past as a No.8 for Auckland and, as French coaches are wont to do, has been selected both on the blindside and at the base of the scrum for Castres. Tekori has the physical gifts to be one of the stand-out players in this autumn’s rugby world cup, which will be a homecoming of sorts for him: he left Samoa to play for Auckland before coming to France, and it was actually Auckland and All Black legend Gary Whetton who was responsible for his move to Castres. All four of the Samoan second-rows selected for the world cup squad [Tekori, Daniel Leo, Kane Thompson and Filipo Levi] have considerable experience of playing in the backrow, which leads one to believe that the Islanders will play a fast-paced handling game rather than one based either on set-piece dominance or multiple one-out ruck ball. With Tekori on the pitch, they have an athlete of rare potential, even in international rugby terms. Here’s hoping that he gets the ball in some space. 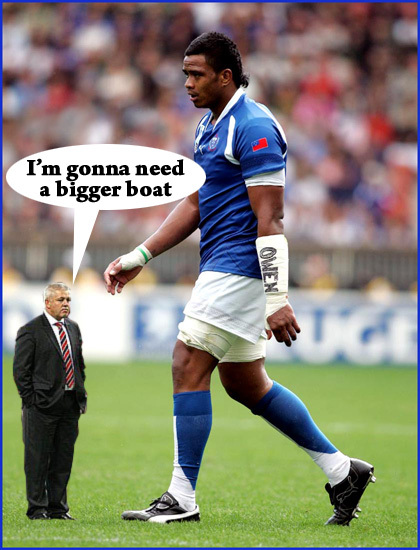 This entry was posted in One To Watch and tagged Happy-Go-Lucky, Headhunters, Joe Tekori, Kack-handed Photoshop, One To Watch, Samoa by dementedmole. Bookmark the permalink.